Finding the ideal engagement ring is easier than people may think. The reality is, an engagement ring is a symbol of your love and commitment to each other, and as long as both parties are happy with the ring that is usually enough. Understand how to choose a diamond. There are of course the four C's of diamond buying - cut, clarity, carats and color - but there are also basic designs to consider. 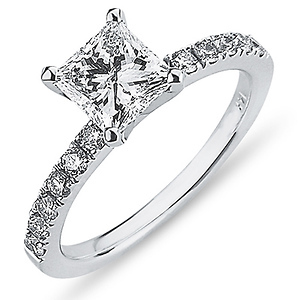 Would she prefer a diamond pave set ring, a solitaire ring, a vintage-inspired ring, or something different altogether? If you do choose to buy a diamond engagement ring, refer to our Diamond Guide to understand the different characteristics of diamonds and how to pick a quality diamond ring. While diamond engagement rings are very popular, you can choose other gemstones, such as sapphires and rubies, as the featured center stone for the engagement ring. Blue sapphire was once considered the engagement ring gemstone prior to the popularity of diamonds. In fact, Princess Diana's engagement ring featured a blue sapphire. If you do choose to go with another gemstone, check out the mohs hardness scale to see how easily it can crack or scratch and if it can be worn every day or sparingly. What is the woman's style? That is, would the woman be happy with a small and very simple diamond engagement ring, or would she prefer something larger and flashier? It is a fallacy that all women will prefer the larger diamond because many women actually prefer a smaller, simpler ring on her finger. It is best to consider her preferences before shopping. Read articles about how to choose a diamond, about the various diamond setting styles, about diamond cut styles, and think about how that diamond engagement ring will work with the wedding band and men's wedding ring. All of these things play into the decision about which diamond engagement ring to purchase. Find a good retailer from which to buy your diamond engagement ring. This does not mean you have to go to a brick-and-mortar store and talk to salespeople and try on a lot of rings, although that's not a bad idea. We are talking about dealing with a trustworthy source that can provide not only a high-quality diamond at a fair price but who can also provide you with a variety of information to help you make the right purchasing decision. Online stores, such as JewelryVortex, offer jewelry at a great value and service. While it can be a stressful decision, shopping for a diamond engagement ring can be fun and exciting. Simply do your research, keep the woman's needs and preferences in mind, consider the budget, and think toward the future. Have any other questions or concerns on buying jewelry? Call our jewelry experts at JewelryVortex.com toll free at (888) 517-3777 Monday - Friday, 10am-4pm PT or click here to email us anytime.